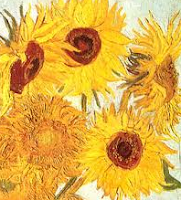 Vincent Van Gogh is famous artist, who painted a lot of paintings, including 'The Sunflowers' and his self- portrait (above) . He was born in Groot Zundert, Holland on March 30 1853, and committed suicide while he was at a very young age in 1890 . His father was a pastor. He had a very tough life as a child and was unhappy. 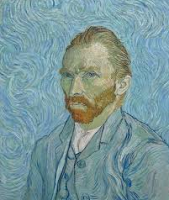 Vincent Van Gogh FINALLY became an artist in his late twenties. Before he started painting, he worked at a bookstore and as an art salesman. He fell in love with two girls and both were unsuitable and unhappy romances. We have been trying to paint in his style. 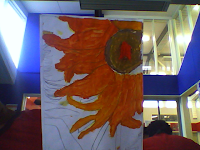 We have also been learning about other artists but he is my favorite artist so far. I think, Room 19 has enjoyed learning about Vincent Van Gogh. Thank you very much for checking my work and saying it is suitable for my age.